We are in love with this custard. And what’s not to love about it? It’s thickened with mineral-rich and digestive-supporting gelatin. Also, it’s allergy-friendly! You can use whatever milk you’d like, so dairy-free is an option. And it doesn’t need eggs (thanks to that gelatin). Omit Dandy Blend if you want it to be grain-free. From our Allergy-Free Cooking eCourse. Serves 5 (in half pint jars). Whisk smooth the coconut milk. Pour 1 cup into a measuring cup. Sprinkle gelatin over the top. Put the rest of the milk in a saucepan. Add honey, sea salt, vanilla, coffee substitute, and cocoa powder. While whisking, heat over medium heat until smooth and it just comes to a simmer. Remove from heat. By this time, the gelatin should be mostly dissolved into the milk, which you know because most if not all of the white crystals are gone. Whisk well, until it’s as smooth as you can get it. Add the gelatin mixture to the chocolate mixture a little at a time, while whisking constantly and quickly. When smooth and fully combined, pour into custard cups or half pint jars. This recipe will fill 5 half pint jars to the top or 6 half pint jars about 3/4 full. Transfer to fridge to chill and set up. After an hour or so, top with shaved chocolate. Return to fridge to continue chilling, about 4 to 6 hours. 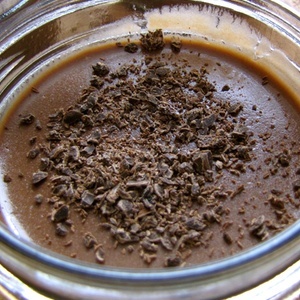 To make vanilla custard: Omit cocoa powder and coffee substitute. Increase vanilla to 2 or 3 tablespoons.